It has been some time since I last blogged about archaeology so in this post – which is a contribution to the Four Stone Hearth blogging carnival – I am taking up a question that has driven my work for the best part of the last decade – shellfish and its role as a food for Aboriginal people over the past ~2300 years on north western Cape York Peninsula (Australia’s north eastern ‘pointy bit’), which was the topic of my recent (2010) PhD Thesis. [Note: This post is an attempt at writing about my research in plain English that is free from academic jargon which is something that I’ve wanted to do for quite some time. There’s something dissatisfying about writing a 100,000 word academic thesis that won’t be read, and I think all academics have a responsibility to interpret their work for a wider audience. So my apologies – if you’re looking for something more academic, then perhaps read some of the papers I’ve included in my reference list. Albatross Bay is on western Cape York Peninsula (Fig. 1) is the traditional land or country of a number of Aboriginal clan groups who for the most part live in the communities of Napranum, Weipa, Aurukun and Mapoon. All of the work that I describe here was carried out with the full support and involvement of relevant clan groups and was guided by protocols that they have developed. This is a basic requirement of doing Indigenous archaeology in Australia. Albatross Bay is a large sheltered bay that formed sometime around 6,000 years ago as sea levels rose after the last ice age (the Last Glacial Maximum, or LGM as we like to call it) and located on the north western coast of Cape York Peninsula. The best estimate is that Aboriginal people first arrived here sometime before 40,000 years ago and possibly as early as 67,000 years ago . The earliest evidence we have of Aboriginal people living at Albatross Bay dates to approximately 2,335 years ago, or around 385 BC , give or take a century. This estimate is based on the analysis of a sample of shellfish collected from the base of a smallish mound of shell on the eastern banks of the Hey River. You can still see the pit that the archaeologists left behind when they excavated the site (Fig. 2), which is very sloppy work really. Figure 2. Shell mound excavated by archaeologists in 1994 and visited in 2002. Early theories had it that mounds were formed by Aboriginal people collecting and discarding shellfish while camping in coastal areas . Mounds were thought to have formed at places where people could easily collect a wide range of food sources such shellfish, fish, plant foods and other animals such as birds and wallabies. 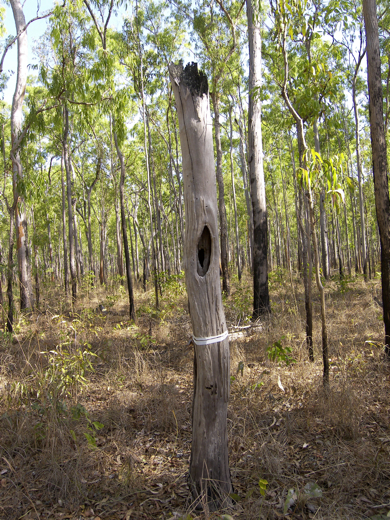 The reason that mounds are found in groups was though to be because Aboriginal people shifted campsites often and largely because of the weather; during fine weather, people would camp out on the open, cool plains but during heavy storms or windy periods, they would seek shelter on mounds in the nearby woodlands. But why mounds? Initially, some suggested that camping mounds helped people to escape mosquito and sandfly attack, however this view was rejected and preference given to the idea that people used mounds because they provided a dry camp site in areas where rain or seasonal flooding made camping difficult, if not impossible. The following image shows a typical mound in the open, with woodland to the rear (Fig. 4). 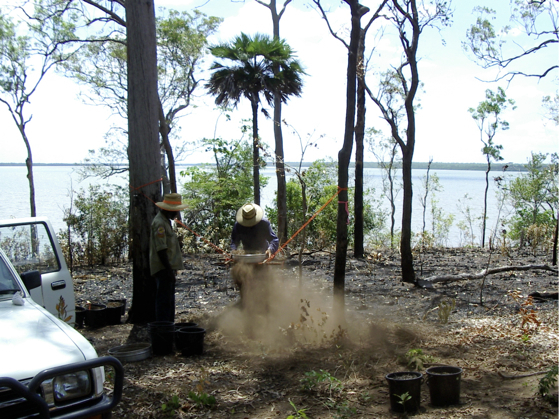 In the late 1990s Aboriginal custodians in partnership with archaeologist Dr Roger Cribb began a project that aimed to record and protect shell mounds. Today, shell mounds are very significant heritage places for Aboriginal custodians and are associated with many stories about the creation of Albatross Bay and the activities of ancestral beings in the landscape. I first visited Albatross Bay in 2000 to meet Aboriginal custodians and to work on this project and this later turned into a larger research project that aimed to answer a very broad question: how did people use shellfish at Albatross Bay? The first task in this project was field survey to find and record shell mound sites. Aboriginal custodians and I recorded several hundred mounds over a year or more, visiting many parts of their country that were difficult to access. We walked though dense mangrove forests and scrubs, across hot bright saltpans and claypans and sheltered under the shade of the cool open woodlands during smoko breaks. We were always accompanied by Elders and young children; all keen to visit and check up on their country or to collect or hunt some fresh bush food. On the mounds we found many other things: old fireplaces, stone axes and water carriers made from the baler shell. We also recorded other kinds of places such as scarred trees made by people collecting wild honey (Fig. 5). After a long dry season of surveying the monsoon system shifted south from the equator which in turn pushed me south as well. Archaeologists tend to struggle with working in the wet season in northern Australia. The heavy rainfall – measured in metres – means that tracks are boggy or cut by flooding of creeks, the grass grows thick and tall, and the regular rain ruins any serious fieldwork plans. It’s also a terribly hot and sticky time of year that lasts between December and March, or sometimes longer as it has this year. After the wet passed, I headed north again to work with Thanakwithi people to collect samples from shell mound sites we had found on their country. We were interested in discovering more about the ages of the mounds there and the kinds of things that people were doing when they were using them. What foods did people eat? What types of tools did they use? How quickly did the shell mounds build up? We dug very small pits, usually around 50 cm by 50 cm in size, carefully stripping back one layer at a time. All of these samples were sieved and sorted (Fig. 6), their contents weighed and counted before being transported to a lab for more detailed investigations. Lab work in archaeology is usually very slow and it took almost a year to completely finish sorting through the shell mound samples we had collected. It is also far less exciting than doing fieldwork – there are no scenic landscapes or wildlife. Just the four walls of a lab and what seemed at the time like mountains of shell along with a radio, volunteers and of course, the blessed airconditioning. But that is the stuff of archaeology: detailed analysis of new data collected in the field enables us to build up our knowledge of the past. So what was the final verdict on the shell mounds of Albatross Bay? Well, there is no final verdict – just a new theory. I disagreed with what other archaeologists had said about seasonal patterns of movement and the use of mounds as camps sites to escape wet ground. During our surveys, we found mounds in areas that according to earlier theories simply should not have been there. For example, many mounds were found on the edges of low cliffs or on soft sandy dunes where flooding could never have been a problem. Some mounds were found in isolation, others occurred in groups of up to ten or more other mounds and dating suggested that in these large groups not all of the mounds were of the same age. It soon became clear that earlier explanations for shell mounds did not account for all of the archaeological evidence that we had collected . There had to be more to them . The detailed lab analysis was very important to developing a new theory about how people used shell mounds. Through this, we discovered that there were very few types of food in the mounds that we investigated. There was certainly a great deal of shellfish, particularly two specific species: kwambuck (Anadara granosa) and he’ere (Marcia hiantina). 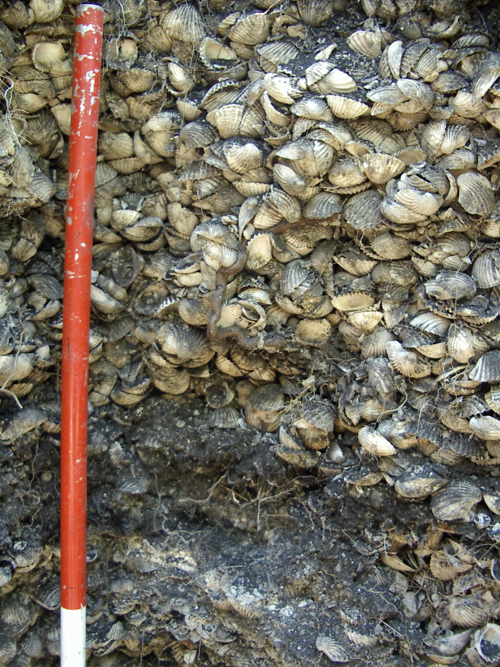 We calculated that these two species made up over 80% of the shellfish found in the mounds. Both species live on mudflats in mangrove lined creeks where they can sometimes be collected in very large quantities. Some Elders described how in times past their parents collected these shellfish, filling up buckets and carry bags, and sometimes whole canoes. Unfortunately though, the shellfish were not always there: the shellfish beds tended to move about a little from year to year, and they were not always available in large numbers. Insights such as these helped me to realise just what might have been going on with shell mounds at Albatross Bay. They were not created by people using a wide range of different food resources while camped in the area for months at a time. The evidence did not support this at all. We found very few bones from fish, mammals, birds or reptiles in any of the samples we investigated and this suggested that people rarely collected foods other than shellfish while using mounds. Furthermore, the shellfish that people used to build mounds would simply not have been enough to sustain people camping in one area for long periods of time (months or more). Mounds built up over hundreds of years or more, and the shellfish in them were not always available in large quantities or for long periods of time. Artefacts made from stone or bone were also rare, suggesting that people carried out a very limited range of activities when using these sites. You can see below just how densly packed the shell is in these mound sites (Fig. 7). Together, this evidence supported the idea that mounds may have been used as a special purpose campsites, used only at times when people were collecting shellfish. The natural changes in the availability of mudflat shellfish also meant that these events had to be carefully timed for periods when the tides were very low and shellfish were abundant. At these times, people organised ‘shellfish harvests’ that varied in size depending upon how much shellfish was available. In some cases, only a small number of people took part – perhaps one or two family groups – but at other times, when shellfish were very abundant, more people would participate. After a few days or perhaps longer, the shellfish harvest ended and people went to other areas to focus on other kinds of food. How often these shellfish harvests occurred is not yet known; perhaps many times a year, or just a few. Why exactly people built mounds still remains something of a mystery however I certainly do not think that these mounds were built by accident. Mounds stand out today because shell is very hardy and durable, lasting hundreds or thousands of years in the open harsh tropical environment. I suspect that this fact was not missed by the generations of Aboriginal people who collected the shellfish, hauling them through the mangroves and up the sides of existing mounds. People aren’t silly, and there are probably very good reasons for doing this that we just don’t understand at present. This is a question that I’m presently investigating in my research. This is only one story for the Albatross Bay shell mounds. Other mounds that remain to be discovered or excavated may tell a different story entirely. Traditional Owners also see things differently, though it’s not my place to tell stories that they have shared with me. I should briefly acknowledge and thank the Traditional Owners who permitted me to work on their country at Weipa. I also thank Dr Darlene McNaughton for providing some comments on a draft of this post. See David et al., 2007. This rockshelter has been very well dated, with at least two earlier dates suggesting it began to be used from 32,000 and 39,000 years ago respectively, though the 40,000 year estimate is well accepted. See Appendix 2 in Morrison 2010; original dating by Bailey, Chappell and Cribb 1994. They were described first by the surveyor J.T. Embley, a surveyor, during work int the region in the 1890s and later also recorded by the ethnologist Walter E. Roth (1900). Bailey wrote a PhD thesis on mounds in the area and was the main person who proposed this model. Bailey, G.N., 1977. Shell mounds, shell middens and raised beaches in the Cape York Peninsula.Mankind 11(2), pp.132-143. Bailey, G.N., Chappell, J. & Cribb, R., 1994. 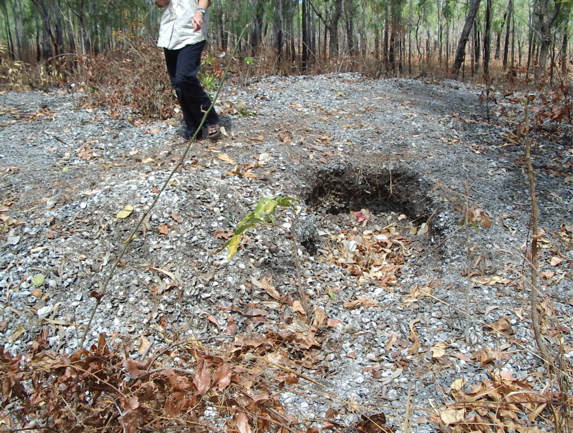 The origin of Anadara shell mounds at Weipa, North Queensland. Archaeology in Oceania, 29(2), pp.69-80. David et al., 2007. Sediment mixing at Nonda Rock: investigations of stratigraphic integrity at an early archaeological site in northern Australia and implications for the human colonisation of the continent. Journal of Quaternary Science, 22(5), pp.449-479. Embley, J.T., 1897. 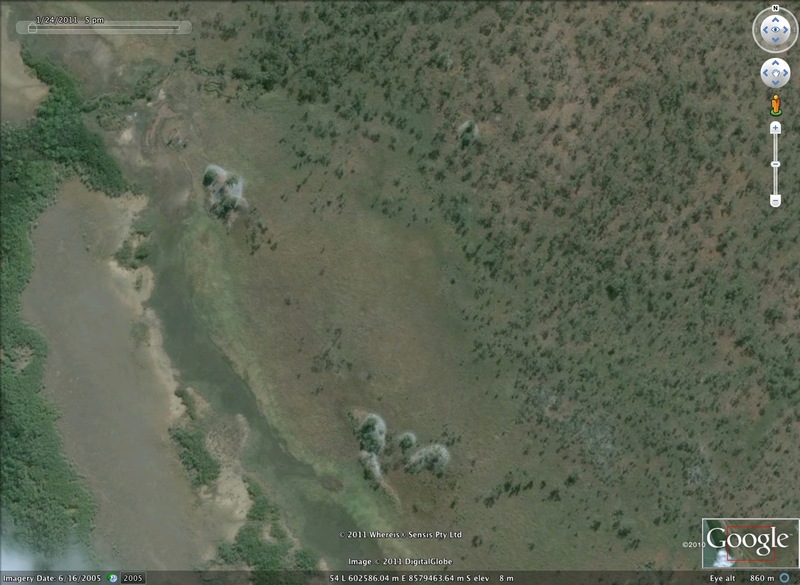 Aboriginal mission reserve with river soundings – Cook District. Roth, W.E., 1900. Report of the Northern Protector of Aboriginals for 1899Brisbane: Queensland Government. Morrison, M.J., 2003. 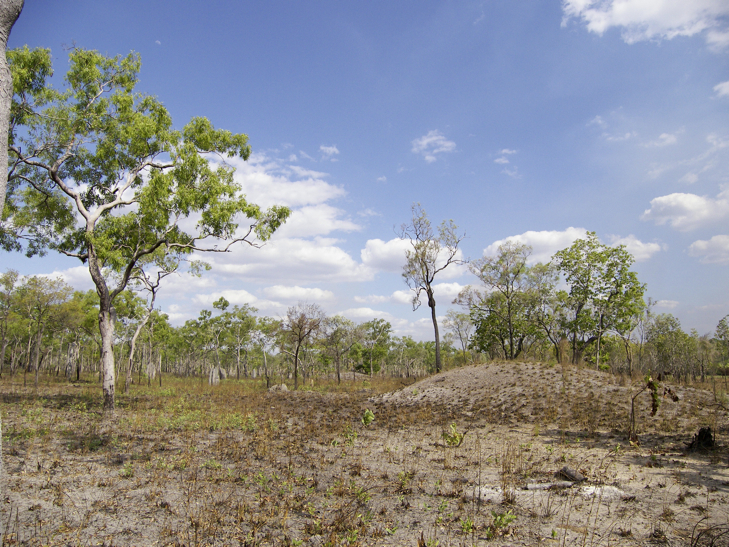 Old boundaries and new horizons: the Weipa shell mounds reconsidered. Archaeology in Oceania, 38(1), pp.1-8. Morrison, M.J., 2010. 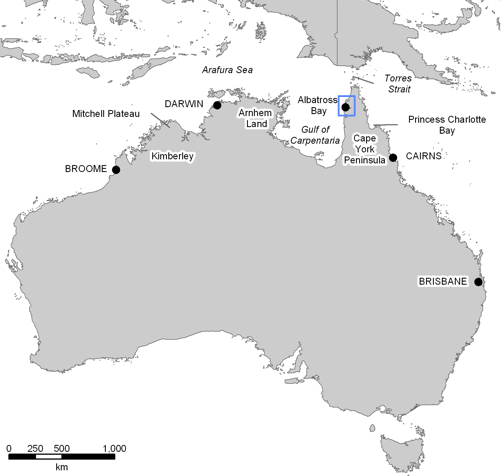 The shell mounds of Albatross Bay: an archaeological investigation of late Holocene production strategies near Weipa, north eastern Australia. PhD Thesis. Adelaide: Flinders University, Department of Archaeology.